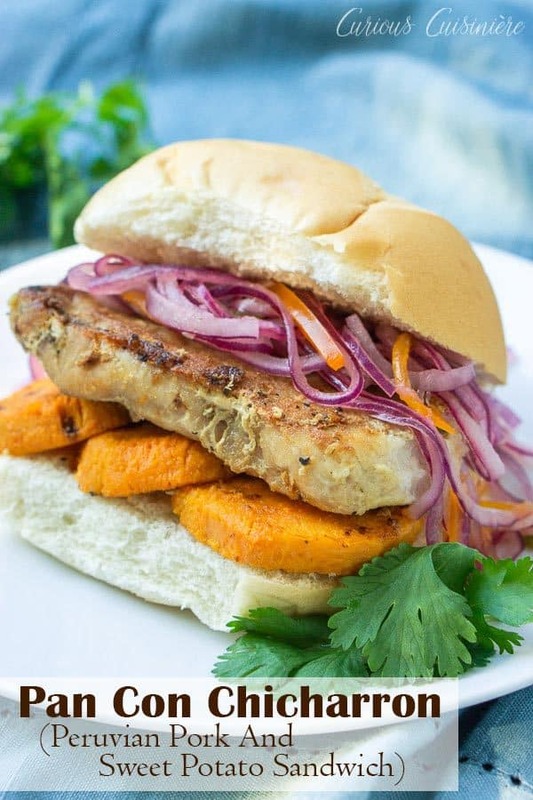 Pan Con Chicharron is a flavorful Peruvian sandwich made from the unique combination of slow braised pork and sweet potato topped with a crisp red onion relish. In Peru, it’s traditionally eaten for breakfast, but we think it’s the perfect meal for any time of day! 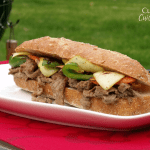 A Pork And Sweet Potato Sandwich? Pan Con Chicharron is a sandwich whose flavor combo may seem a bit strange to those of us in the States. 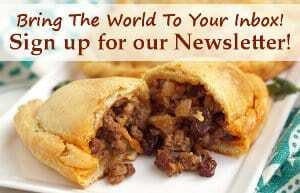 But, the combo of sweet, salty, and tangy is quite traditional of Peruvian flavors. 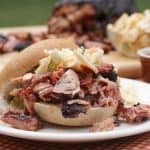 We love pork with sweet ingredients like apples and barbecue sauce. So why not go the sweet potato route? 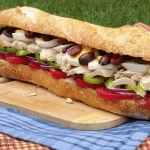 Like many dishes in South America, the concept for this sandwich originated in Spain. Today, it can be found in many Spanish speaking countries. In Peru, this sandwich has a couple of names. 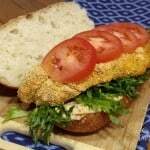 It is often referred to as “pan con chicharron” (bread with chicharron) or “sanguich de chicharron” (chicharron sandwich). What makes chicharron unique is the combination of braising and frying that creates an incredibly tender, but also wonderfully crispy piece of pork. To get chicharron, you place your pork in a skillet and cover it with 1 inch of water. Then, you simmer the pork, covered for 1 hour and uncovered for another hour. The first hour infuses the pork with moisture, and the second hour lets the liquid evaporate so you are left with only the pork fat that has rendered out of our your cuts. As the pork continues to cook, it fries up to a nice golden brown in its own rendered fat. The concentration of pork flavors and the caramelization you get on the pork gives you loads of flavor. All you really need for seasoning is a little salt and pepper to make the natural flavors of the pork pop! What Cut Of Meat Is Used For Chicharron? 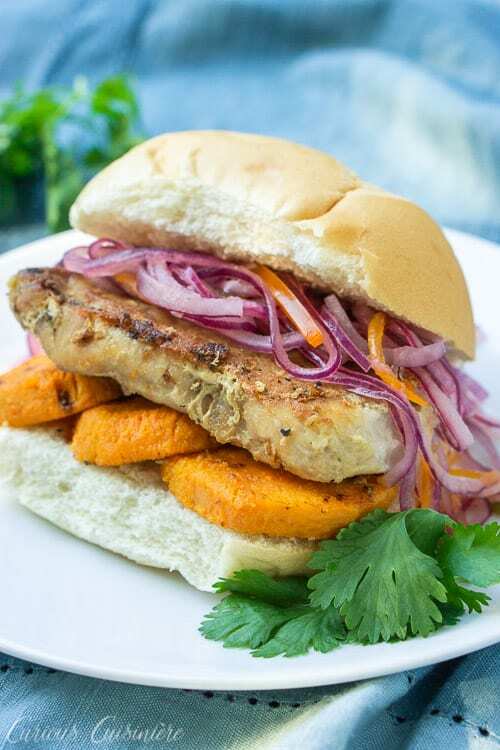 Traditionally pan con chicharron is made using pork chops, pork ribs, or pork belly. Which cut you choose depends on a couple factors. Most importantly, you want to choose a cut of meat that is easy for you to get (some places, pork belly itsn’t all that common). And, you want to choose a cut of meat that you’re comfortable working with. Something to keep in mind is that the cut of meat you choose will effect how your chicharron turns out in the end. 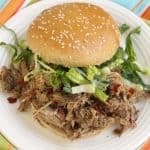 Since the pork fries in its own rendered fat, a fattier cut will give you a crispier, more deep-fried piece of meat verses a more pan-fried piece of meat. Pork belly has the most fat to render out, and will become the most crispy. Pork ribs have a nice balance of fat and really great flavor from the bones. Pork chops are easy to use, but tend to be a bit lean. To remedy this, we add a little olive oil to the pan to help the chops fry up nicely. 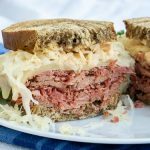 This really is a sandwich that relishes in simplicity. After the pork, you only have two other ingredients: sweet potato and salsa criolla. The sweet potato is boiled and then (if you like) fried in the pork fat, after your pork is finished cooking. The creamy sweet potato adds a wonderfully robust sweetness to the salty and crispy pork. 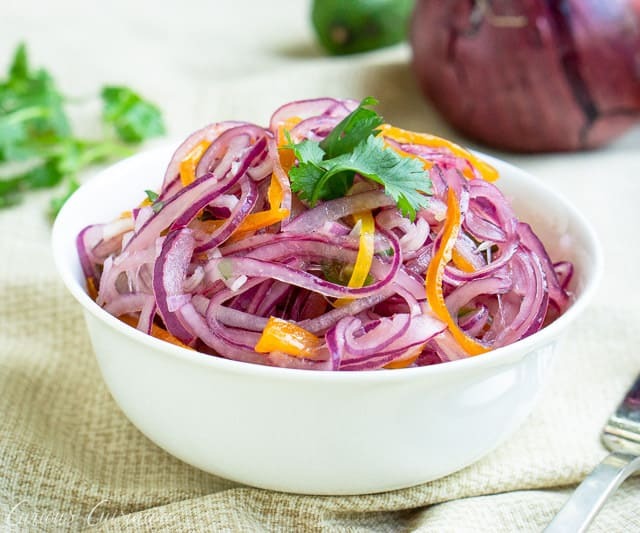 Salsa criolla is a Peruvian red onion relish that has a hint of tartness from lime juice and a bit of spice from chiles. 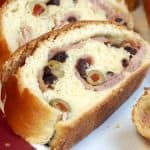 It is incredibly easy to prepare and is not just eaten as a topping for the sandwich, it is also often eaten as a side dish as well. 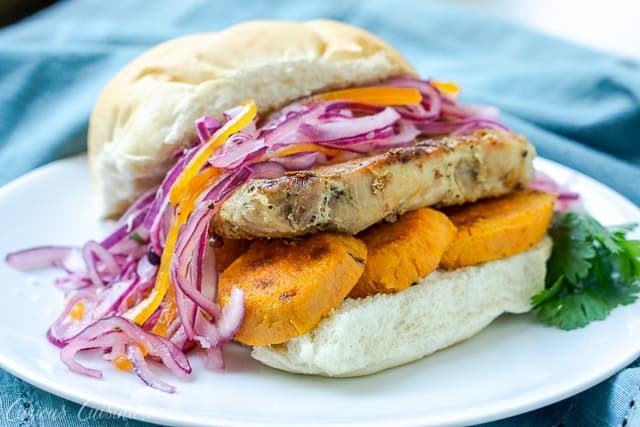 The crispness and slightly acidic flavors of the salsa criolla cut through the fat and creaminess of the pork and sweet potato, really rounding out the flavors of each bite of this sandwich. In Peru, pan con chicharron is traditionally eaten for breakfast. Since the pork takes 2 hours to cook, it is typically made the night before. That way everything is ready for you when you’re ready to start your day. Even though it’s a traditional breakfast, you can find these sandwiches sold throughout the day. We like to eat them for lunch or an easy summer dinner. Would you eat pan con chicharron for breakfast or later in the day? 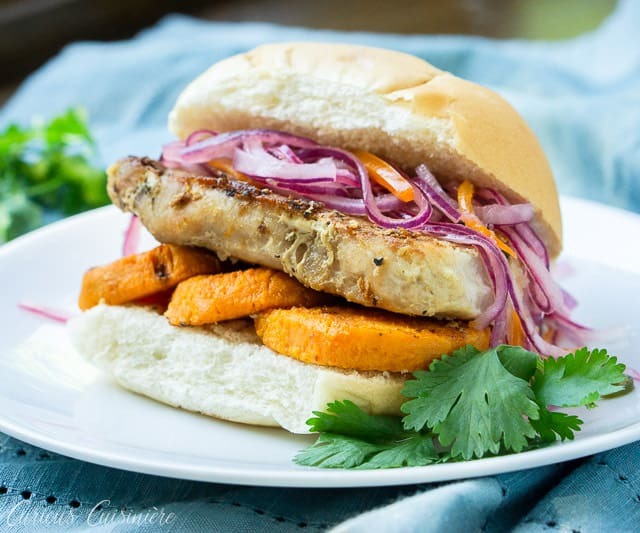 Pan Con Chicharron is a flavorful Peruvian sandwich made from the unique combination of slow braised pork and sweet potato topped with a crisp red onion relish. 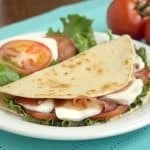 It's the perfect meal for any time of day! Grease a heavy skillet with a little olive oil. Arrange the pork in the skillet. Drizzle the pork with the remaining olive oil and sprinkle with salt and pepper. Pour water into the skillet until it covers the pork by 1 inch. Cover the skillet and bring the water to a simmer. Reduce the heat to maintain a simmer and cook, covered, for 1 hour. After 1 hour, remove the lid form the skillet and continue to simmer for an additional hour, until the liquid has completely evaporated and the pork beings to fry in the skillet. While the pork is cooking, place the sweet potato in a saucepan and cover with water. Boil the whole sweet potato until it is fork tender, roughly 45 min. When cooked, remove the sweet potato from the water and let it cool slightly. Once cooled, peel the sweet potato and slice it into rounds about a ¼ inch thick. Once the pork liquid has reduced completely out of the skillet, continue cooking the pork until it is golden brown. Flip the chops and brown them on the other side. Remove the pork from the skillet. (If desired,) Add a little oil to skillet, if necessary, and add your cooked sweet potato rounds. Fry the sweet potato slices until golden on both sides. Build your sandwich by layering your bun with some sweet potato slices, a pork chop, and a generous heap of salsa criolla. 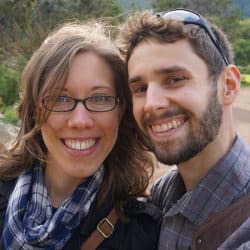 Great article!!! I just discovered that the one I had from Callao, Peru, was pork belly. Deep fry over low heat (200 to 240) for hours in lard. than turn up heat to crisp up… When I tasted it, it brought back all those memories of Peru years ago, and I realized I was choosing the wrong cuts to duplicate what I had for years and years!! We’re so glad you found the recipe that brings back memories! Thanks for sharing!